Classification systems developed prior to the 1990s, such as those of Cronquist (1981) and Dahlgren (1989), typically recognized the order Urticales, which included the families Cannabaceae, Cecropiaceae, Celtidaceae, Moraceae, Ulmaceae and Urticaceae, as then circumscribed. Molecular data from 1990s onwards showed that these families were actually embedded within the order Rosales, so that from the first classification by the Angiosperm Phylogeny Group in 1998, they were placed in an expanded Rosales, forming a group which has been called “urticalean rosids”. Hop (Humulus lupulus) has been the predominant bittering agent of beer for hundreds of years. The flowers’ resins are responsible for beer’s bitterness and their ability to extend shelf life due to some anti-microbial qualities. The young shoots are used as vegetable. 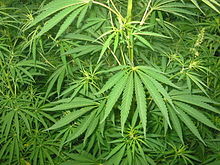 Some plants in the genus Cannabis are cultivated as hemp for the production of fiber, as a source of cheap oil, for their nutritious seeds, or their edible leaves. Others are cultivated for medical or recreational use as marijuana. Several selectively bred “strains” have been produced for both higher and lower yields of THC, other cannabinoids, as well as terpenes with desired flavors or aromas, such as blueberry, strawberry, or even citrus. ^ “Cannabaceae | plant family”. ^ Stevens PF. (2017). “Cannabaceae Genera”. Angiosperm Phylogeny Website. Retrieved 4 April 2017. ^ “! !Cannabaceae Martinov”. Tropicos. 2017. Retrieved 4 April 2017.